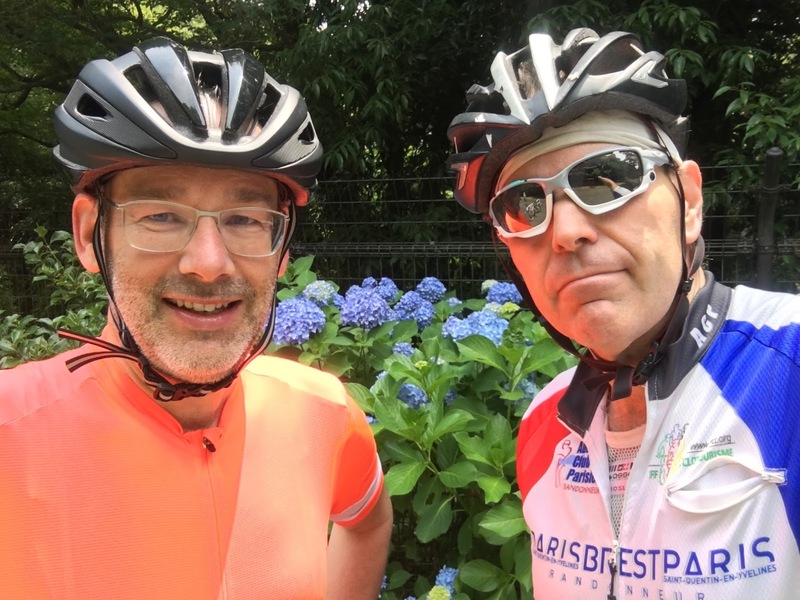 POSITIVO ESPRESSO: Training for Velothon Berlin ... in Tokyo?!? Fabian, one of MOB's close friends and a former Japan resident (for 3 years quite a long time back), was in town this weekend. 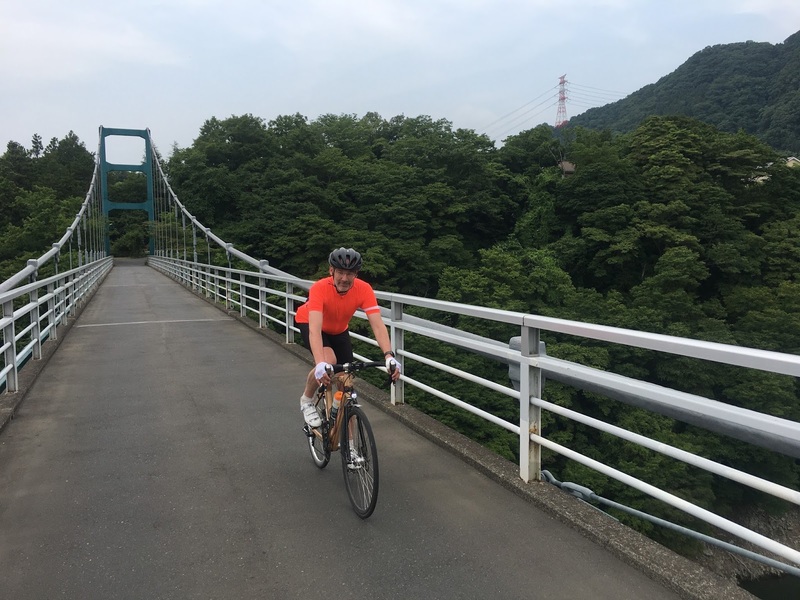 He brought his cycling gear and got a pass from his wife and daughter so we could go for a ride, as we did the last time he was in Tokyo several years back (more years than I would like to admit). Fabian said that MOB will come to Berlin next week from Bremen for the annual Velothon event. 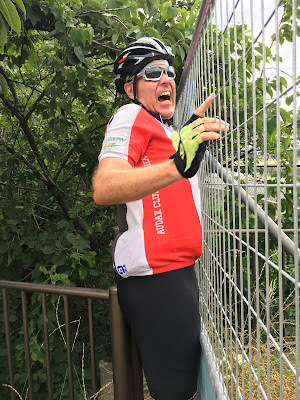 Some of you will remember reading about the massive Velothon event on this blog from 2011 or 2010. I think for more recent news, you can find reports on MOB's blog, "there is no "I" in cyclyng." This was an important part of -- perhaps THE MOST important part of -- his training regimen. 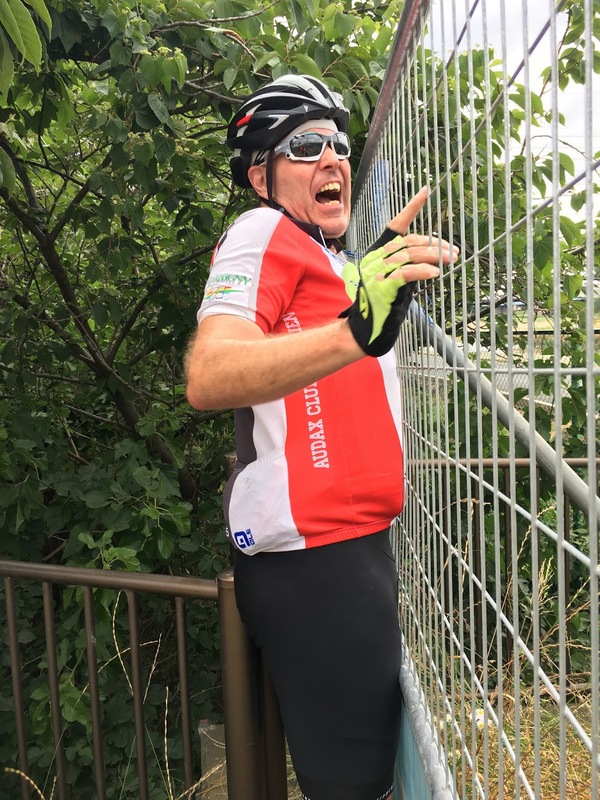 Seriously, Fabian does ride regularly, but said he tends to stick to short, after work rides, typically 35 kms. Today we made it around 110 kms - the classic Otarumi/Tsukui loop. 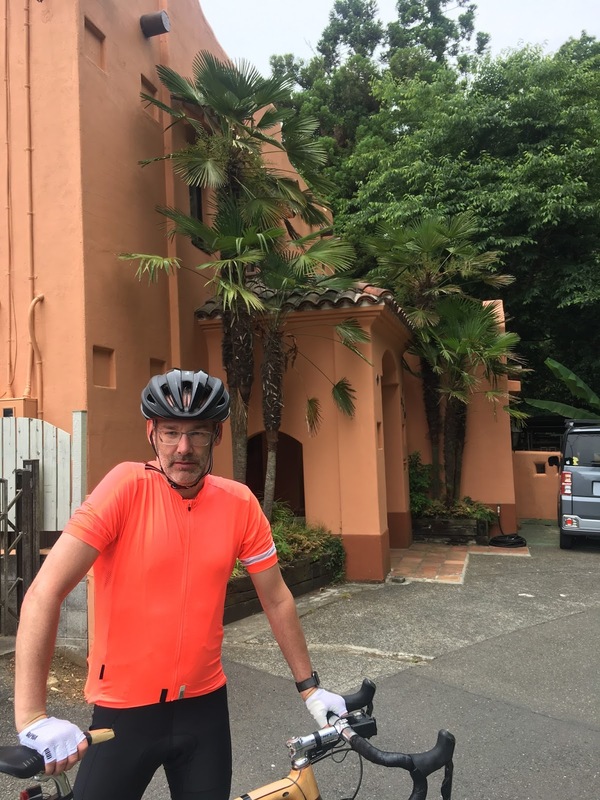 I promised him if he comes back again in the next few years, we will definitely put bikes in rinko bags and go to the countryside for something different and a bit more impressive. Still, for a return to Japan after many years, riding out along the river and through the sprawling suburbs may not be so bad. Anyway, I have had a cold and am not yet fully recovered, but was happy to try to "ride through it" on this special occasion, as today was rare, remarkably decent cycling weather for June in Tokyo. Not too hot. Dry. Not too humid. Mostly overcast to keep the sun from being to harsh. A bit of a wind from the E/SE so a headwind on the return, but not as bad as sometimes. 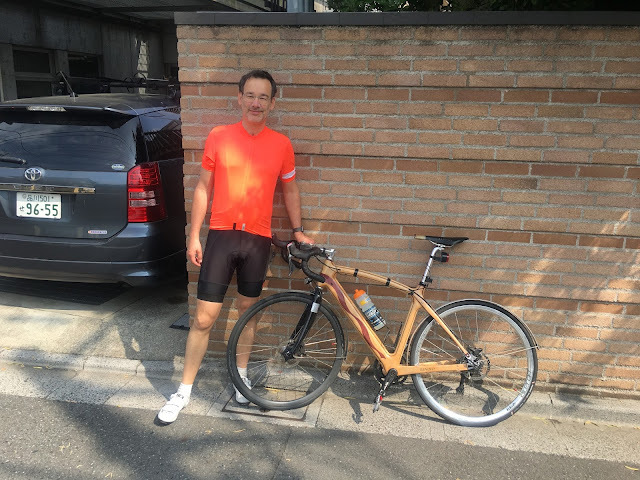 Fabian borrowed the Renovo -- his first time on a wood frame, and first experience with Di2 and hydraulic disk brakes. All good. 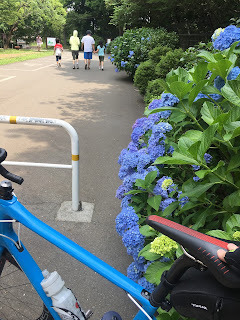 I rode the sky blue Parlee. 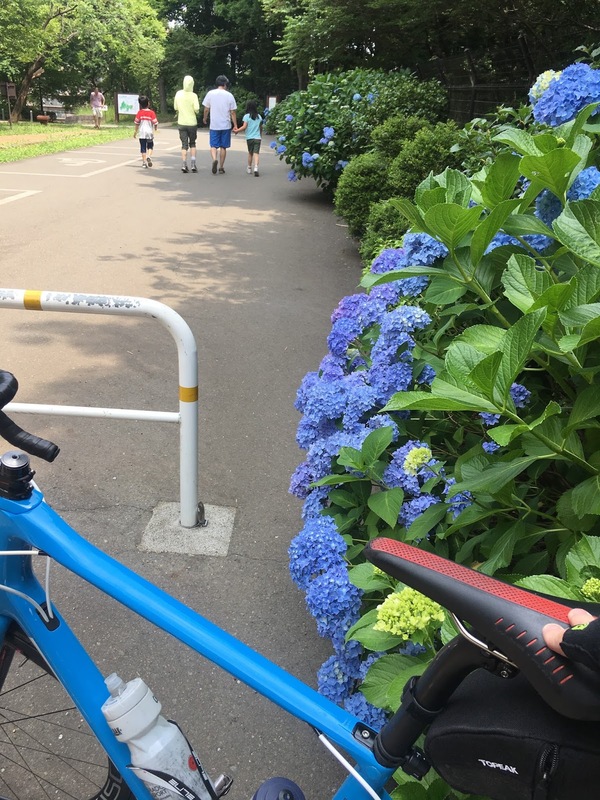 I thought the color went very well with the blue hydrangeas along the Tank Road. 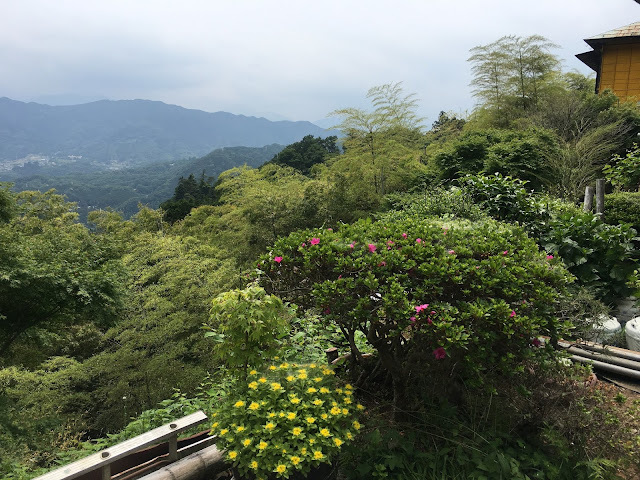 We went out Onekan, then took the tank road, the North side of Lake Tsukui, then up the west climb of Otarumi Pass, stopped at the ramen shop for ramen (me) and chahan (Fabian), then back via Takao and Hachioji. 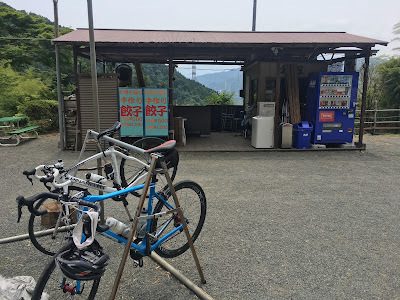 Bikes welcome at the ramen shop near the top of Otarumi Pass. They treated us like kings, as usual. Incredibly nice people running this shop, who are delighted at repeat visitors. View from our garden table. 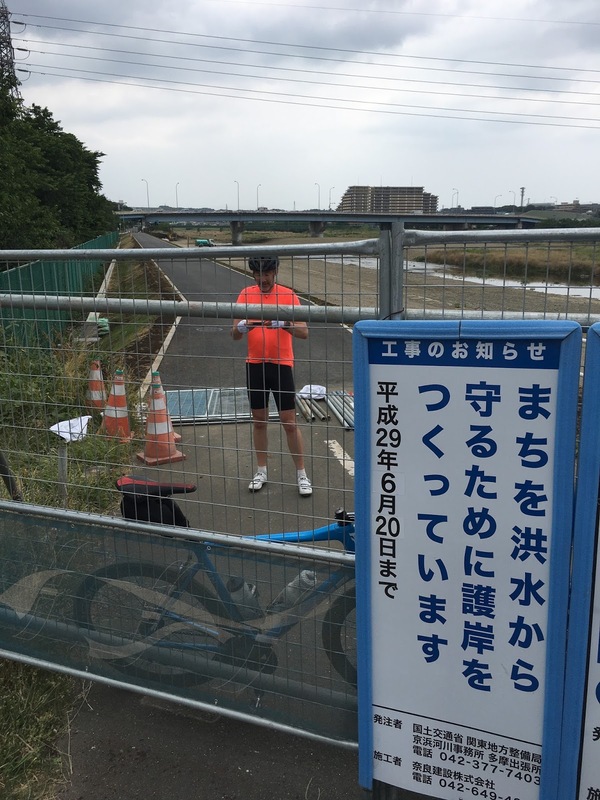 One stretch of path was closed off along the Asagawa east of Hachioji. It was easy to get over the barriers and ride along the nice new pavement. The other end was a bit more difficult. 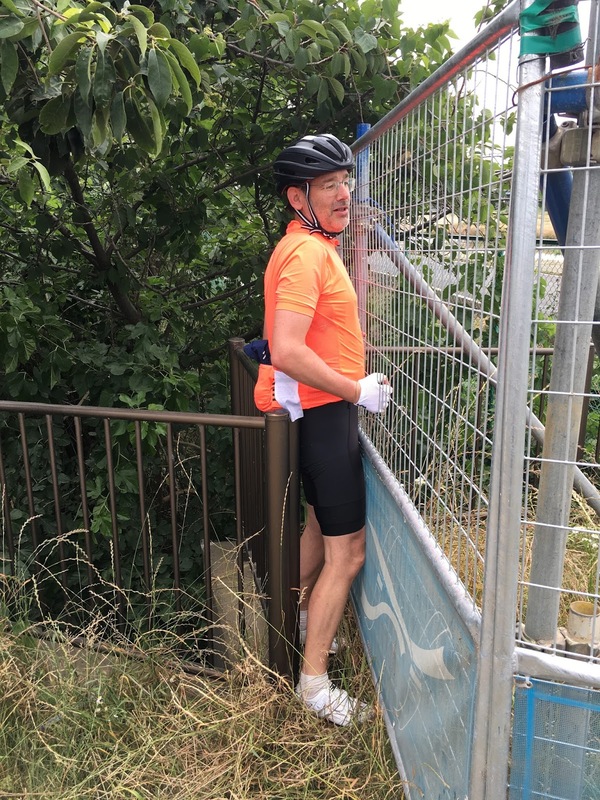 I went around the fence first, then Fabiand handed over the bikes and joined me. A tight fit for Fabian. An even tighter fit for me! Thank you again for the excellent training! I was able to follow MOB for the first 15 km after all! Moreover I was very happy with my total time at the end.